Early in the morning on the 6th of December (the Independence Day of Finland) my husband and I woke up to make us ready to leave for the bus station. The hubby was feeling very feverish and I was feeling very miserable because I thought he couldn’t travel…But he’s a stubborn Finn who doesn’t let a little cold prevent him from doing something we both had planned since August. Next morning after a hearty breakfast at our hotel the BIG moment was finally there! It’s only 15 minutes walk from the hotel to the Zoo but we decided to take a taxi. I was so happy to tell the taxi driver the adress: To Knuti! 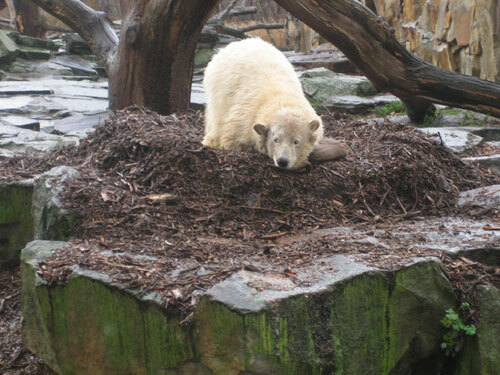 When we came to the Zoo we headed straight away to Knuti’s enclosure and there he was lying on his mulchbed napping! The first thing that striked me was that he looked so small, much smaller than in the pictures I’ve seen. I was also (happily) surprised how close to him we could get. Oh, he was so CUUUUUTE!!!!!!!!! I had to fight not to start crying – it was such an emotional moment! I couldn’t believe it – there I was admiring this miracle baby. I just stood there watching and suddenly Knuti lifted his head and waved with his paw. Yes, he did! I’m sure he said: “Hello, Mervi, I know you’re there. Welcome to my world!”. I was blowing kisses to Knuti from all the Knutians when I heard somebody calling Mervi, Mervi, Mervi. It was Marga and two other Knutians from Berlin (I’m sorry I don’t recall your names but we met many times during the day and I’m very pleased to have met you both). I also met Christina M and Brigitte from Canada. It felt so unreal to see the faces of people whom I’d already known by name for several months! Since Knuti was still napping we decided to go and see the feeding of papa Lars. 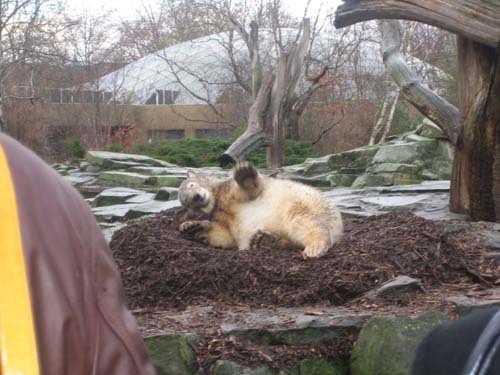 What an impressive polar bear he is! He looked a little sad or maybe bored. I’m sure the Casanova was missing the babes! Then he went into the water and the way he moves is amazingly gracious. Before I knew it Thomas Dörflein was standing next to me saying :Kooooom Lars! And Lars swam towards him to get his food. He also gave us a wonderful performance by standing on his two paws catching the meat that TD threw to him. 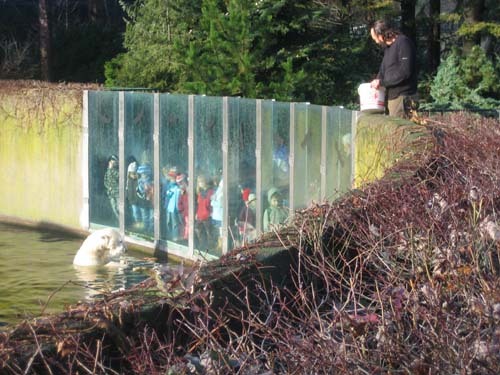 It was so fascinating to see the bear and his keeper co-operating in such a lovely way! I must tell you about that special moment when TD was standing there just some centimeters from me. I hardly dared to look at him and I’m sure I blushed like a stupid schoolgirl and my face was propably as red as my hair! But he looked at ME and SMILED!! That smile can make the ice melt…. I was dying to have a picture of him and me but decided to behave myself. He was doing his job and I didn’t want to disturb him. Oh, how I regret it today…I don’t think he would have minded – I saw him talking with people very patiently and kindly – with that beautiful smile on his face…. After the feeding Marga and we went to the restaurant to have a cup of coffee. The weather was really cold and windy. What a pity there wasn’t any Husbands Garden. It would have been better for my hubby to stay there having Nanny Brown looking after him…My guess is that there were other husbands, as well, who would have preferred to be somewhere else! 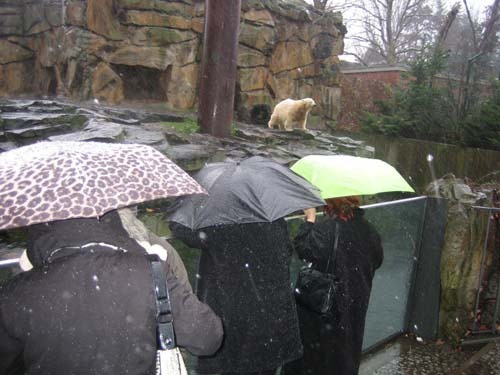 We then strolled along at the Zoo visiting the other bears and the white wolves. On our way back to Knuti we even met Annemarie with his handsome son. At Knuti’s enclosure there was a wonderful surprise. Knuti-Judi and Jazmin – the two Knutian celebrities!! It was again a very emotional moment – I was so happy to finally meet these wonderful ladies! Knuti-Judi gave me my scarf – it is so beautiful! I want to thank Barbara and Webbiene once again! I’m so proud to wear it. There was another celebrity, too! Dr Schüle was interviewed by a RBB team. Sorry, Clydene, I didn’t take any pictures of him, either. I curse the day when I learned about good manners!! Knuti was swimming and playing with a ball and the wooden birthday candle. There was quite a crowd watching him and since it started raining all the umbrellas made it difficult to see anything. I tried to use my elbows to get a better spot… Finally I managed to get to the glas wall and could have a very close look at the beautiful eyes, the cute ears and the lovely paws! I could almost touch his lakritznase!! What a sight it was! He was so clever having the ball in his mouth and keeping the candle between his paws! He simply looked so happy! I had also been looking for Yeo but didn’t see her anywhere. Suddenly Brigitte came running and said I had just missed her. While we were having coffee Yeo had been at the enclosure looking for me. What a pity! But this episode had a happy ending – Yeo came once more to Knuti and we could meet. Now the feeding time was approaching and Knuti got up from the water waiting for TD and the food. Unfortunately my hubby was now feeling so lousy that we had to leave. He offered to go to the hotel himself because he knew I would have loved to stay longer but it didn’t seem fair so we left. In the evening we went to meet LeenaP at the Potsdamer Platz. The place was very beautiful with the modern architecture and with all the Christmas decorations. We also saw the Winter World with lots of snow! And the Christmas market, of course. Since we had been spending 6 hours at the Zoo in that cold weather we decided to stay mostly indoors chatting. Because Leena lives in Berlin she could tell us a lot about the wonderful city. Thank you, LeenaP, it was so nice to meet you!! After another night it was time to visit the Zoo again. When we came to Knuti’s enclosure guess who was already standing there. Yes, Knuti-Judi! I asked her if she had spent the night there but she said she had taken a short break. I’m not sure I believed her, hahaa….We also made plans to make our stay in Berlin longer. 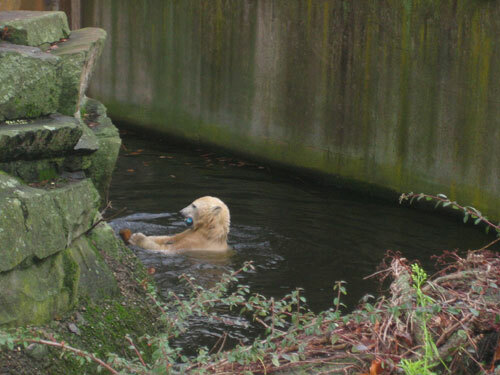 The enclosure next to Knuti’s is empty so maybe we could rent a höhle for a couple of months and live there close to our favourite bear! Knuti was awake playing with his jutebag on the mulchbed. He must have been swimming earlier because he was very white and shiny! 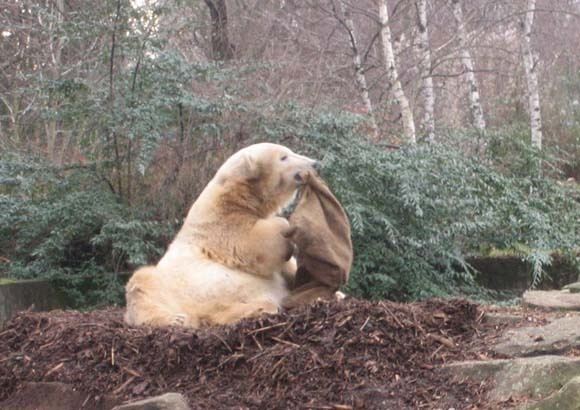 Every now and then we could here a little sound when he was using all his energy to make the bag squeeke. That was so lovely! He was dancing with the bag and I wish you all could have seen the looks he occasionally gave the audience asking: “Did you see that? Shall I do it once more?” He also made his famous Fidel Castro imitation with a stick in his mouth! He’s playing by himself but believe me – he’s very well aware of the presence of the audience! The feeding of the bears was about to begin so we went to the Nasenbären enclosure where TD starts the feeding. After a while TD came in and what a show it was! The little rascals were all over him! The funniest thing was when they were checking his pockets. It was wonderful to watch them so close. I have heard people saying about TD that he’s just a keeper. That’s not true!! The way he acts with his bears – not just with Knuti – tells us how much he loves all the bears at the Zoo. 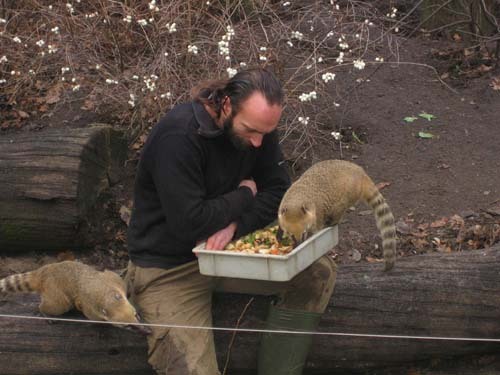 He has that tender smile on his face when he’s feeding them…I wish I could describe it better…. He’s got a special charisma! 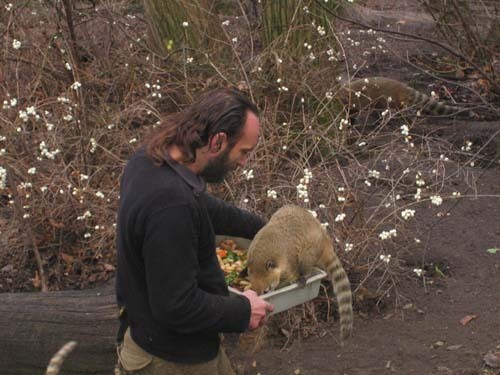 Now we had to hurry to Knuti’s enclosure again to get good spots to see something – soon it would be Knuti’s turn to get his food. He was already eagerly waiting, I guess he could smell the food…Knuti started his dinner with some lettuce which he ate on the stones. He didn’t want to go into the water. Because of the crowd I couldn’t see if he got croissants, too – I hope so! Then it was time for the next dish which was a big fish – I think it was a salmon. Knuti carried the fish to the mulchbed and turning his lovely tushie to the audience started to eat the main course. Before Knuti’s feeding we had a chance to meet Barbara and Christopher and after a while Marion came, too. It was so nice to meet them all. I told Marion how much all the Knutians enjoy her pictures and reports and how grateful we are. She said she just loves Knuti and enjoys every minute staying there photographing – no matter what the weather is like! Time for a standing knuvation, don’t you think? All the wonderful things always come to an end and now it was time to say goodbye to Knuti and all the Knutians. By this time even Dumba, Jazmin and Liesel were at the enclosure. There were a lot of hugs and best wishes and again I had to fight against the tears…Just before we left Dumba insisted on bying me a Knuti cup. That was so kind of you, dear Dumba. I have that cup in a special place where I can always see it – I wouldn’t dream of using it, hahaa…The same goes for Marga’s beautiful quilt. And Jazmin – thank you so much for the beautiful necklace. That I will wear and then I’ll be thinking of you! Knuti-Judi, thank you for the delicious chocolate. Just one last look at our darling Knuti and it was time to leave. Tears, tears…. My husband and I thank you all for a wonderful time at the Berlin Zoo! After meeting all my beautiful friends from the whole world he now understands how much you all mean to me! I’m pretty sure he’s become a Knutian, too!! And I think that both Knuti-Judi’s and my hubby are worth an extra eloge for standing there in the pouring rain for hours with their more or less knuzy wives…. I definitely have a suitcase left in Berlin so I’ll be back…..